It is amazing how personal taste can change and evolve over time. A few years back, I would say with absolutely certainty a headboard is a must to complete a bed and a bedroom. Now I take it all back. Instead of a traditional headboard, I am moving toward decorative pieces that can be easily changed to suit my need for change. 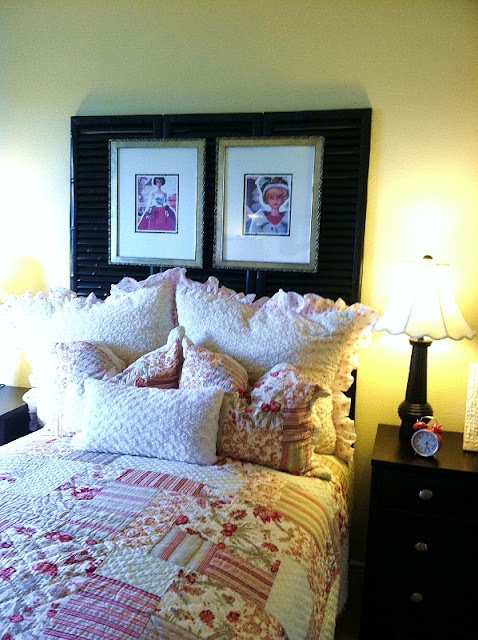 For a while now, I am adoring the idea of using shutters as headboard. And now, I am even more sure after seeing this. My take on home decor now is to have pieces that can be changed to update a home or space. After all, we can't buy a new house or even change major furnishing on a whim. However, we can change accent pieces to update the look of a space. What do you think of this shutter headboard idea? I like the idea of shutters, but the pictures I don't care so much for. I agree with you. I like the shutter but will definitely do something else where the pictures are. I have considered this idea, but I think it's just too much for me. I've had a hard time finding the shutters to fit my bed, and I'm not sure how to really attach them. I am lame. You can find shutters here. I think prices are quite reasonable. I don't think I've seen this before but I really like it it's a great idea.